The Football Pink has been produced since 1919. It was a publication that was snapped up on the streets of Cardiff on a Saturday evening over the decades with a comprehensive results service from all Saturday afternoon's games and the first match reports from Cardiff City's game that afternoon. Varied kick off times and technology though has meant the paper is not as viable anymore. The Newcastle equivilent was scrapped a month or so ago and now the popular South Wales edition has gone the same way. Here are the thoughts of Wesrern Mail and Echo editor Richard Williams. 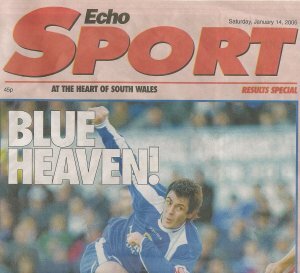 "In years gone by the Sport Echo was part of the traditional Saturday afternoon sports scene in South Wales. "But times have changed. The football and rugby worlds in particular have been switching games to accommodate live TV and this has had a serious effect on our ability to provide comprehensive coverage. "Also technology has changed how the media reports its sports news. "Where years ago fans were interested in reading minute-by-minute information about a match, the internet and mobile communications now mean that sports fans can access instant sports information at the switch of a button." Speaking as editor of this website I have heard tales over the years of how people in South Wales have bought the Football Echo and posted it to relatives all over the world. With information available here and on other local websites "Uncle Tom" in Australia can keep up with games via the net as if he was listening to Radio Wales in Canton while the game is being played. It's the end of an era and it's with sadness but inevitability we say farewell to the Football Echo. It leaves us with a Cardiff City victory and new signing Steve Thompson adorning the front page.